In no time flat, you and your kids can make enough soap buddies for weeks of bath time fun! 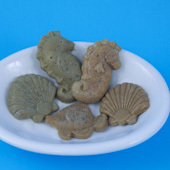 Kids of all ages enjoy the squishy fun of making little soaps in a variety of shapes and colors. 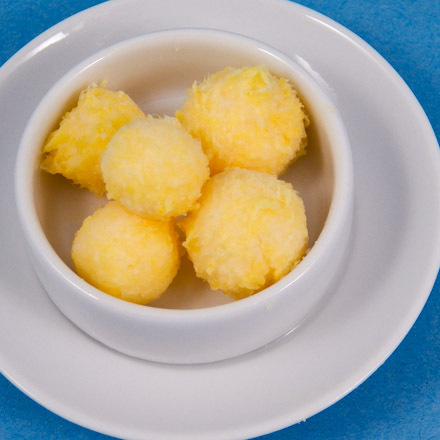 Shape them into balls, or create cute shapes with soap molds. For a quick, easy and inexpensive gift, package several bath buddies in a net or organza bag tied with a pretty ribbon. This craft is well-suited for family, group or classroom craft time, and takes very little preparation by the adult or teen leader. Related project: For another soap making technique, see the Layered Soaps craft project. Related project: Soap buddies make great gifts for Father's Day! 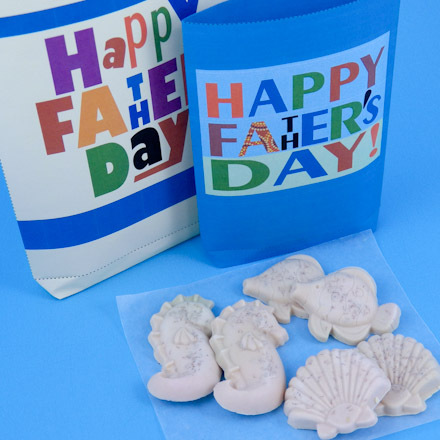 Make soap balls or mold the soap into shapes, wrap the soaps in wax paper, and put them in a gift bag. 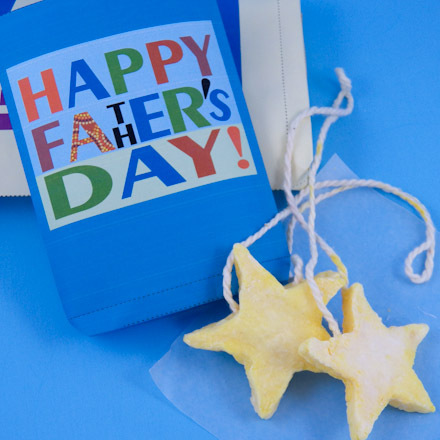 See the Tube-shaped Gift Bags craft project for Father's Day printable bag patterns. Gather the materials needed for making bath buddies. If you are doing this project with a group of children or adults, have a bar of soap and a bowl for each person and a grater per every two or three people. To make the craft go faster, grate the soap in advance. Grate the bar of soap into the bowl. Finer shavings work best. Tip: Add fine, dry herbs to the shavings. Put a few drops of food coloring into 1/3 cup of water. Add the colored water to the bowl. With your hands, mix the contents of the bowl until it forms the consistency of play dough. 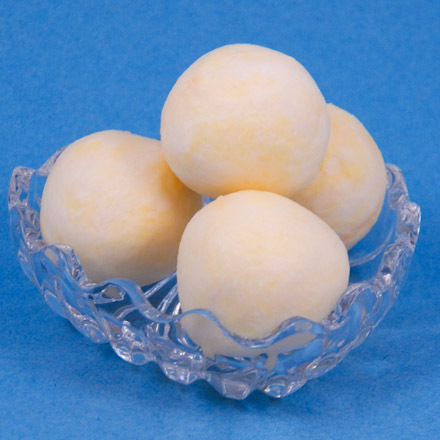 Shape the soap dough into several small balls or any shape you like. Place the soaps on a sheet of wax paper and let dry overnight. 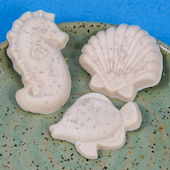 Tip: Make shaped soap with plastic soap molds. Press soap dough into lightly greased molds. Let set up overnight before unmolding. Tip: If you want to make soap-on-a-rope, cut a piece of string and tie the ends together. Push the knotted end gently into your finished soap. That's it! Now you can have some bath time fun! Thanks to Sandra F. of Ontario, Canada for sharing this craft idea with Aunt Annie's Craft Exchange in 1996. Sandra shares, "I have used this project at camp and in a kindergarten classroom. It always goes over very well!" Tip: Use soap molds to make shaped soaps for gift-giving or to place in the guest bath. Tip: Pat the soap dough flat and cut shapes using cookie cutters. Sandwich string between two layers to make soap-on-a-rope! Makes a terrific Father's Day gift. For the printable bag pattern, see Tube-shaped Gift Bags craft project.